Your family’s outdoors at the pool when all of a sudden you hear thunder. Is it time to head indoors? The short answer — yes. If you’ve lived in the south for long, you know that pop-up storms are a frequent event during the long days of summer. They crop up seemingly out of nowhere and often disappear just as quickly. But in between, they do present some dangers. Many of us spend more time outdoors and around water during the summer heat. That means more exposure to lightning and other storm-related hazards. Lightning is amazingly hot. In fact, it’s hotter than the surface of the sun at around 50,000 degrees Fahrenheit. Lightning is most common in the summer. But while it occurs more often during the frequent summer storms, it can occur year-round. Lightning strikes number in the millions. Each year, according to the National Weather Service, lightning strikes the United States about 25 million times. Lightning can be deadly. Strikes kill an average of 47 Americans each year and injure many others. Based on these facts alone, it’s clear that lightning can be dangerous. But there are steps you can take to stay safe — read on for lightning safety tips. Skip the outdoors if the forecast calls for storms. That’s an easy step to take to avoid the potential dangers. Your outdoor activity can wait on a day without thunderstorms in the forecast. Follow the 30-30 rule. If you see a lightning strike, count to 30. If you hear thunder before you reach number 30, go indoors. Stay inside for at least 30 minutes after the last clap of thunder. If you can’t get indoors, get low. Crouch close to the ground, but with as little of your body touching the ground as possible. Lightning current can transmit across the ground surface. Stay away from water. During a thunderstorm, lightning can travel through plumbing. Put the technology down. That includes electronic equipment of any sort, including corded phones. Cell phones or cordless phones are safe to use. Avoid concrete. Lightning can travel through metal bars and rods in concrete walls and floors, so it’s important to stay away from them during storms. Watch the weather. When working outdoors, be sure to stay weather aware and know when any impending storms are headed in your direction. Seek shelter indoors. The best option when a storm moves in is to get inside a building that doesn’t have concrete walls or floors. When indoor shelter isn’t possible, shelter in a vehicle. Seek out a hard-topped metal vehicle with the windows rolled up. Stay in the vehicle for at least 30 minutes after the last thunder clap. Do not seek shelter under a tree, utility pole or piece of equipment. 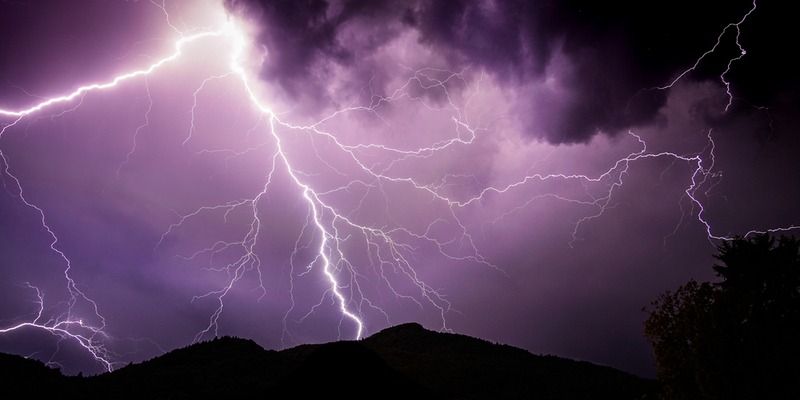 Lightning is most likely to strike the tallest object in an area — stay away from that object. When an emergency occurs, Erlanger has you covered with the region’s only Level I trauma center, as well as six hospital locations for care.